The Society for Peace Unity and Human Rights (SPUR) is a 16 year old human rights organisation operating in Australia, dedicated to protecting the unitary status and the territorial integrity of Sri Lanka. We have been active in countering actions denigrating Sri Lanka and challenging the spread of malicious misinformation. 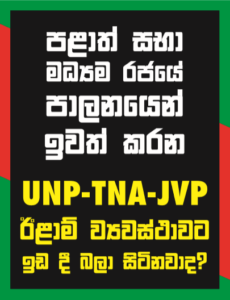 *Encourages racist, political activism similar to what is being practiced by the Sri Lanka Muslim Congress during the recently concluded Eastern Provincial Council elections. *Provides opportunities for foreign funded NGOs to boldly challenge and obstruct the implementation of progressive government policy such as the Divineguma Bill, drafted for the benefit of the poor. *Discourages the cultivation of a “one Sri Lanka” culture by encouraging provincial based, racist parochialism. *Threatens national unity by giving minority political parties disproportionate power, allowing them to secure racial based outcomes. *Halve the number of politicians populating a bloated four-tier governance arrangement in Sri Lanka, draining the public purse. *With the repealing of the 13th Amendment, Sri Lanka will prosper as a Unitary State where people will live as one enjoying the full gamut of human rights equitably. At present, the 13th amendment provides a safe heaven and a camouflage for separatists, racists and international agents to freely prosecute their agenda to Balkanise Sri Lanka. It is time to once and for all to extricate ourselves from the political handcuffs put on us by the Indians nearly 25 years ago.